Will your supply chains survive the twists and turns of the global economy? Can it deliver mission-critical supplies and services in the face of disaster or other business interruption? A resilient supply chain can do those things and more. 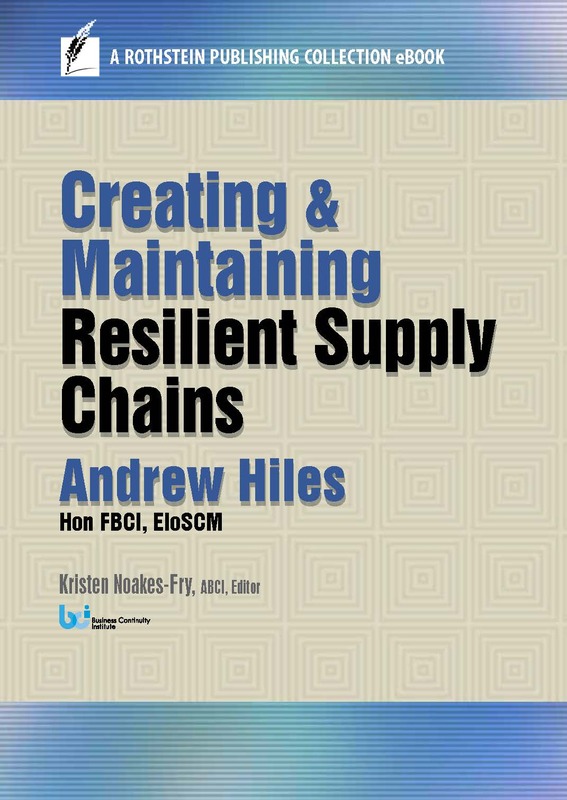 In Creating and Maintaining Resilient Supply Chains, global expert Andrew Hiles applies the principles of risk and business continuity to enable a reliable flow of materials and information that is a “win” for everyone involved. Understand the criticality of procurement and supply chain management to the health of your organization. Relate the time-tested principles of good business continuity planning to constructing a reliable supply chain. 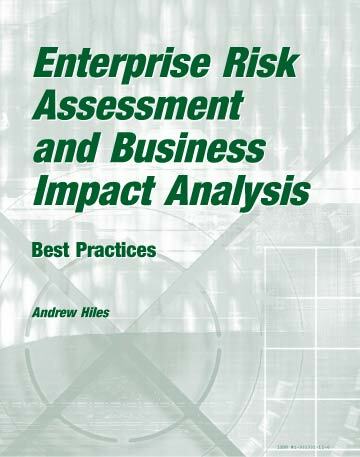 Apply risk management principles to evaluate vendors and create effective contracts. Create the specifications that will result in a good tender or bid. Anticipate contract issues when you are dealing with other legal systems, including International Commercial Law, Anglo Saxon Law, Civil Code, Sharia Code, and European Law. In one short book, Hiles distills the knowledge of a lifetime to prepare you to handle risks, pitfalls, and potential ambiguities. As a result, you will know how to carefully plan and negotiate supply chain relationships that benefit all the organizations involved. While many BCPs deal with physical incidents, you may face situations in which all your physical assets remain intact – and yet you still lose your operational capability. Perhaps the most common cause of these incidents is supply chain failure. BC Managers need to work together with their colleagues in procurement departments to ensure continuity of mission-critical supplies and services. Even when supply is maintained, price shocks could impact an organization’s competitiveness severely – or even its viability. Relate your role as a BCM to supply chain continuity. Appreciate the criticality of procurement and supply chain management to your organization. Understand the basics of procurement including the procurement cycle and associated procedures. See how the supply chain works. Know the importance of strategic procurement. Identify key risks – and some solutions – in procurement, supply chain, and contract management. Essential to the operation of the supply chain are tenders and contracts. Briefly, an invitation to tender (ITT) is a formal invitation giving suppliers the details of what the buyer needs in order to choose a supplier. For this process to take place, the buyer outlines all the specifications that will allow the supplier to offer a tender or bid on the project. Once a tender or bid has been accepted, a contract, or legally binding agreement, will follow, ensuring that the winning bidder will perform as specified. We will begin by discussing in detail the requirements of a carefully constructed tender and then, at the end of this section, address legal and content issues for an effective contract. Andrew Hiles, Hon FBCI, EIoSCM, is an internationally renowned practitioner, consultant, and trainer of two generations of Business Continuity professionals. 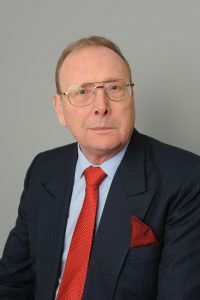 He is founding director, First Fellow, and Honorary Fellow of the Business Continuity Institute. In 2004, he was inducted into the Business Continuity Hall of Fame by CPM Magazine for demonstrating consistent high standards over time and global reach. He has authored, edited, or contributed to 15 books and has written over 250 published articles on business continuity topics for leading international magazines. 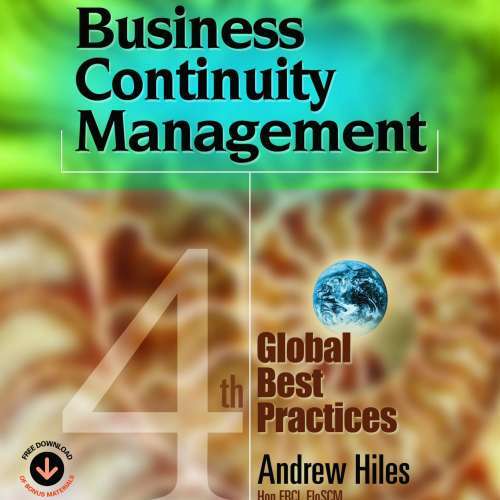 Hiles’ dedication to training new generations of BC leaders is evidenced by his being among the first to provide truly international training in enterprise risk management, business continuity, and IT availability management in some 60 countries, as well as successfully pioneer BC training in Africa, the Middle East, China, Pakistan, and India. He has consulted globally for some 35 years, advising blue chip companies and major public sector organizations, including European Community institutions. Kristen Noakes-Fry, ABCI, is Executive Editor at Rothstein Publishing. Previously, she was a Research Director, Information Security and Risk Group, for Gartner,Inc. ; Associate Editor at Datapro (McGraw-Hill); and Associate Professor of English at Atlantic Cape College in New Jersey. She holds an M.A. from New York University and a B.A. from Russel Sage College. 56% said supplier capacity did not meet customer demand. 49% suffered raw materials price increases or shortages. 45% experienced unexpected changes in customer demand. 35% Suffered fuel price increase/shortage. Another survey conducted by Genysis/Ovum/Datamonitor found that 25% of customers changed utility vendors for poor customer service, costing each industry £2.6 bn. Increasingly, procurement functions are consolidating contracts into a few, large contracts involving fewer, strategic, suppliers and closer electronic links. Moreover, the trend to outsourcing is still gathering momentum. The two trends mean that an enterprise has considerable dependence on its suppliers, with consequent supply-side risk. Moreover, supply chains may be long and opaque – for instance, up to 30 different companies could be involved in providing an internet based service. For convenience, the following text refers to outsourcing; however, most points apply equally to other types of service and supply contracts. One word of caution: beware “partnerships.” Legally, a partnership involves sharing risks, profits and losses jointly and severally: this is not what most vendors mean when they refer to a partnership. The words of one senior manager make the point: “Whenever I hear the word ‘partnership’ I know I am going to be shafted!” If it is genuinely a joint venture, breaking new ground, then sharing risk and reward may be appropriate. Even then, however, each party may have (or develop) different motives and objectives with consequent breakdown of the relationship. Studies by Birkbeck College of University of London and Bank of International Settlement (BIS) indicate that over half of outsourcing contracts suffer serious dispute between supplier and customer, and 70% of IT outsourcing users hit problems. Half of the disputes are resolved by changing vendors, while 22% are terminated by customers bringing the service back in house. An approach that has become fashionable in recent years is best of breed purchasing. This is akin to, but not the same as, market leader purchasing (see the discussion of other purchasing approaches below). Best of breed purchasing is based on finding and buying the best product and/or locating the best supplier in each area. Many problems emerge in best of breed purchasing, not the least of which is defining the boundaries of departmental areas. Clearly defined product or service required. Need that can be met by one supplier. Sufficient number of suppliers from which to choose. Clear definition of what constitutes best of breed. Each of these points is important. In order to apply best of breed purchasing, it is first necessary to break down each buying decision into homogenous components which allow valid comparisons to be made. Best of breed also assumes that (at least in essence) one supplier can meet this need and that there are several such suppliers; otherwise, the term best of breed would be meaningless. Finally, it is necessary to define best of breed, though this is not always obvious or uncontroversial. It simplifies purchasing decisions. Purchasing decisions are simplified because one is simply looking for the best product and this dominates other considerations that might normally loom large in such decisions (such as price or strength of local support). Organizations often buy products that they recognize as not being the best because of local or other considerations that compensate for this shortcoming. It reduces risk. Best of breed suppliers are generally well established and usually widely recognized. If so, many other organizations are using the product, presumably several of those will have evaluated the product and found it good. If the product were not good, then it would not be so widely used. Where competitive advantage matters, it can give a competitive edge. There may be intangible benefits. By working with a good supplier, some of its ethos may “rub off”on the purchaser’s own staff. Good consultants especially can have an invigorating impact on an organization (provided that they do not take over entirely). It is not always feasible. For example, the ideal combination of products simply may not mix. This problem also arises with multiple supplier purchasing but it is more acute with best of breed because the latter is driven by having the best in each product class rather than just having an alternative supplier. The best in each class may not always work together. It can lead to integration and compatibility problems. Although market leading products and suppliers tend to work better together, compatibility problems can still arise. When there are problems, it can lead to disputes over responsibility. This should not happen with best of breed suppliers; one expects them to behave in a businesslike and professional manner. However, it is still possible for two suppliers genuinely to believe that the other is at fault. Few suppliers remain best of breed over a long period. A look at any industry over the past 30 years will reveal many names of former industry leaders who have dropped down the list of leading suppliers or have even gone out of business. The question of what to do when a supplier’s product is surpassed by another product needs to be addressed. It can be expensive and may be poor value. Buying best of breed often means paying premium prices. This is acceptable provided one is obtaining commensurate value. Adequate alternative solutions are often available at far less cost. The Business Continuity Manager should be aware of the dangers of buying new products, especially new technologies, even from market leaders. If there is a reason for needing the best, in particular if competitive reasons are driving the decision or it is clear that, in terms of value for money, the best product on offer is the best value on offer, then best of breed is a good policy. Best of breed can also be applied effectively for isolated requirements.